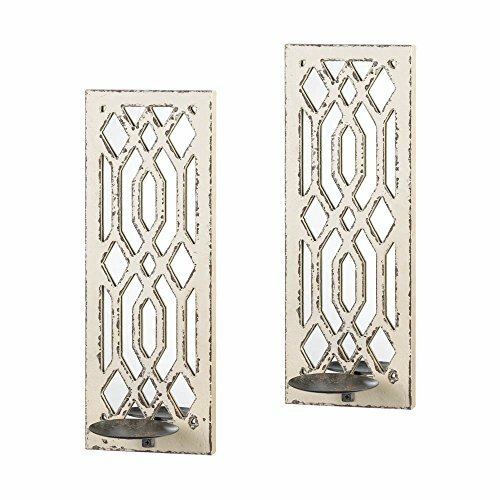 This pair of gorgeous candle wall sconces will cast geometric shadows and luminous candlelight across your living space with timeless style. The wood frames feature geometric cutouts and a weathered white paint finish. Each is 6.75" x 5.25" x 17.25" high. Material: MDF wood and iron. Candles not included. Pair. Item weight: 4.4 lbs. The wood frames feature geometric cutouts and a weathered white paint finish. Each is 6.75" x 5.25" x 17.25" high. Material: MDF wood and iron.